Perhaps it is the fact that I fast and skip breakfast that many of my recent recipes are breakfast-related. I do eat “brinner” (breakfast for dinner) but that is mostly eggs with salsa and sour cream. Based on the recent cassava waffle, keto hot chocolate, and Mexican churros recipes, perhaps my sub-conscious is telling me to eat more gluten-free “brinner” treats. Well let’s add to the breakfast arsenal with these Cinnamon Plantain Pancakes. Similar to the Cassava Waffles With Chocolate, luckily many non-gluten alternatives exist to make the baked goods and breakfast treats we all love and joy. And the beauty of using fruits and vegetables like cassava and plantains is that they are nutrient-dense unlike many of the numerous gluten-free “Franken-food” concoctions you may buy at the grocery store that are laden with sugar and added preservatives. The other option is to purchase gluten-free non-wheat flours like coconut flour, macadamia nut flour, almond flour and alike. These are suitable alternatives but these, too, have been processed and refined to take much of the original food source’s nutrition out. Check Out Our Review Of Non-Wheat Flour Alternatives. Plantains are, in essence, bananas. They are very popular in the Caribbean, South America and Africa. In general, they tend to be starchier in taste and consistency. They are also lower in sugar than traditional bananas, unless you eat the banana very unripened which in that case becomes resistant-starch prebiotic food. Plantains are generally eaten cooked than raw for the aforementioned reasons. Read More About The Importance Of Prebiotics & The Microbiome. The beauty of this Cinnamon Plantain Pancakes is its nutrient-dense nature. Plantains pack 4 grams of fiber and have very high levels of the Daily Recommended Allowance of Potassium, Vitamins B6, Vitamin A, and Vitamin C.
Pastured eggs boast 6 times the nutritional wallop of conventional eggs. But in general eggs are amazing “keto balls” that should be eaten daily, including the yolk, for its healthy fats, Vitamin D, choline, and protein. Chia seeds, a mainstay at Naturopathic Earth, are the par excellence of seeds boasting in one tablespoon, 4 grams of fiber (out of the 5 grams of carbs it has), monounsaturated fats, and perhaps best of all, no discernible taste. It is the chameleon of superfoods. Cinnamon has been discussed ad nauseam on this site. A natural sweetener that doesn’t spike your blood sugar, studies show cinnamon is amazing in regulating your blood sugar, optimizing heart health, and serves as a great antimicrobial agent, among other things. Read this great article on Cinnamon: Nature’s Multi-Faceted Weapon. Try these Cinnamon Plantain Pancakes. 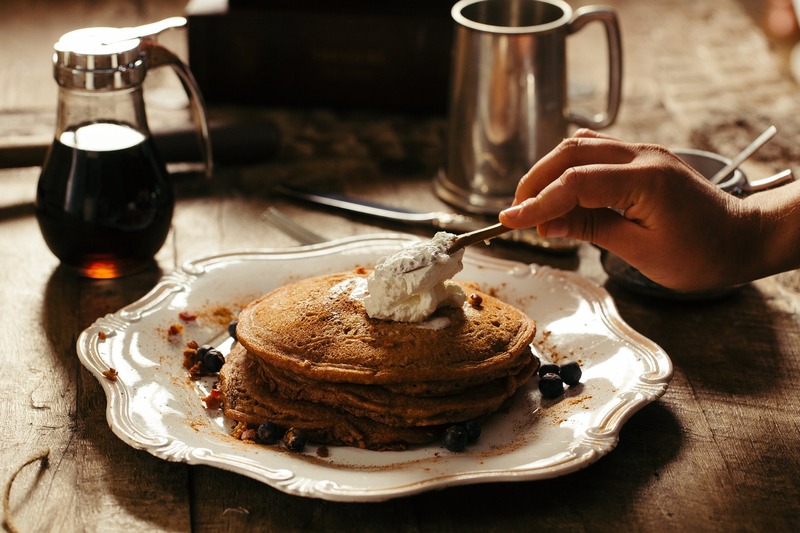 The consistency might take getting used to (since it is not flour-based), but accentuate is high nutrient profile by topping it with cacao nibs, homemade Keto Whipped Cream, organic maple syrup and more! 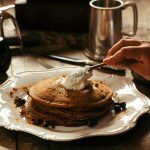 Try these Cinnamon Plantain Pancakes with our Keto, Paleo Hot Chocolate or our Keto, Paleo Eggnog. Buy some of the aforementioned ingredients on Amazon right now! Blend together the plantains, eggs, cinnamon, and chia seeds in a food processor until smooth and non-clumpy. Over a medium heat, scoop two tablespoons of the batter onto a skillet using coconut, avocado oils or grass-fed butter to grease. Cook for 4 minutes or until each side is golden-brown. Add more oil or butter to grease for each additional pancake. Serve with maple syrup, whipped cream, cacao nibs, or whatever your heart desires.